skin, tonsillitis, regional lymphadenitis, and strawberry tongue. Etiology: group A b-hemolytic streptococcus (GABHS). - source of infection – ill person not only with scarlet fever, but other forms of GABHS infections (sore throat, erysipelas, streptodermia). - infection is transmitted by inhalation of infected airborne droplets, rare with food and direct contact. - susceptible organism – children 2-9 years old. Pathogenesis An entrance gate is the mucus membrane of the throat, seldom damaged skin, and maternity ways (at delivery). · Toxic (toxically damage of cardiovascular, central nervous, endocrine systems). · Septic – primary inflammation in the place of infection (tonsillitis, secondary bacterial complication). · Allergic – sensibilization by GABHS proteins (depression of immunity leads to allergic complications – nephritis, arthritis, myocarditis, rheumatism). Clinical presentation: Onset is usually acute and is characterized by a sore throat (often with dysphagia), fever (often above 39 °C), pharyngeal and purulent tonsilar exudates. Anterior cervical lymph nodes, particularly the jugular-digastric nodes just beneath the angle of the mandible, are tender and enlarged. 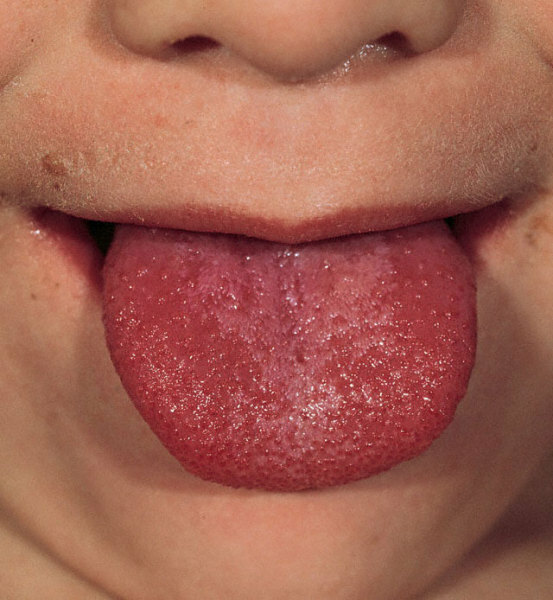 Erythema of the soft palate is common, and an enanthema of “doughnut” lesions on the soft palate. Strawberry tongue. Other features are nausea and vomiting, headache, abdominal discomfort. One to two days later the rashes like “sandpaper” appears, first on the neck and then on the trunk and extremities till the end of the day. The eruption is characterized by dusky red, blanching tiny papules that have a rough texture. Papules are usually absent on the face, palms, and soles, but the face characteristically shows flushing with circumoral pallor. On the body, the rashes are intensified in skin folds and at sites of pressure. In the antecubital and axillary fosses, linear petechias are seen with accentuation of the erythema (Pastia’s lines). The exanthema usually lasts 4 to 5 days and then begins to desquamate, first on the face last on the palms and soles. Pharyngitis usually resolves in 5 to 7 days. 1. Latent period: a few hours – 7 days. • catarrhal regional lymphadenitis (photo). • sympatic phase of “scarlet fever” heart (tones are loud, tachycardia, BP is elevated). • a tongue turns pale till 10th - 12th day, with enlarged follicles. • rise sensitivity to the streptococcus infection, possibility of complications. • with aggravated symptoms (hypertoxic, hemorrhagic). c) severe: toxic, septic, toxic-septic. • and allergic (rheumatism, myocarditis, arthritis, glomerulonephritis). • late (2nd - 3rd week). • secondary (caused by the other bacteria). 1. The diagnose is confirmed by throat culture with group A b-hemolytic streptococcus. 2. Serology (antistreptolysin O, antidesoxyribonuclease B) with their grows in 2 weeks may be useful for documenting recent GABHS infection. 3. The complete blood cell count is helpful: usually white blood cell count higher 12500 cells/mm3, neutrophyllosis, left shift, eosynophylia, elevated ESR ECG, CBC and urinanalysis on the 10th day after the disease began, and on 21th day for possible late complications diagnostic (nephritis, myocarditis). • Scarlet fever, typical form, exanthema period, severe (toxic) degree, complicated by the right side peritonsilar abscess. • Scarlet fever, typical form, recovery period, moderate degree, complicated by the myocarditis. Differential diagnosis: tonsillitis may be seen with diphtheria, mononucleosis, adenovirus, and micoplasm; rashes may be seen with measles, rubella, and pseudotuberculosis. - The severe form of disease, when appears need in undertaking of intensive therapy; patients with moderate forms at age before 3 years. - Sick children from families with bad social-home conditions, especially in the event of impossibility of their isolation to prevent infections transmission. - Absence of conditions for examination and treatment at home. - Sick children from closed children institutions. 1. Bed regime during an acute period. a. In the mild case penicillin orally (penicillin V) for 10 days 50,000-100,000 EU/kg/day divided in 3-4 doses. Erythromycin (or another macrolides) is alternative antibiotic (30-50 mg/kg/day). The course of treatment is 10 days. b. In the moderate case penicillin intramuscularly (penicillin G), the same dose as in the mild case. The course of treatment is 10-14 days. c. In the severe case: cefalosporins of the 1st-2nd generation, klindamycin, vancomycin intravenously for 10-14 days. a. In the mild case large amount of oral fluids. b. In the moderate and severe cases – Glucose and saline solutions IV. 4. Antihistamines (in average doses) – pipolphen, suprastin, claritin, cetirizin. 6. Control of fever (when the temperature is more than 38.5-39 °C); in children before 2 mo and in case of perinatal CNS damage, seizures in the history, severe heart diseases – when the temperature is up to 38 °C with acetaminophen (paracetamol 10-15 mg/kg not often than every 4 hours (not more than 5 times per day) or ibuprophen 10 mg/kg per dose, not often than every 6 hours. 7. Local treatment with antiseptic fluids (gurgling), UV-insolation. Patient may go home from infection department not earlier the 10th day of the illness, in 10 days blood analysis, urinalyses, ECG must be done. Prevention: isolation of the patient on the 10 days, but he mustn’t visit school until 22 day of the disease. Contact person (children before 8 years) must be isolated for 7 days (period of incubation). Key words and phrases: scarlet fever, three lines of pathogenesis, Group A b-hemolytic streptococcus(GABHS), ”doughnut” lesions on the soft palate, rashes “sandpaper”, dusky red, blanching tiny papules, circumoral pallor. Pastia‘s lines, desquamate, purulent and allergic complications.